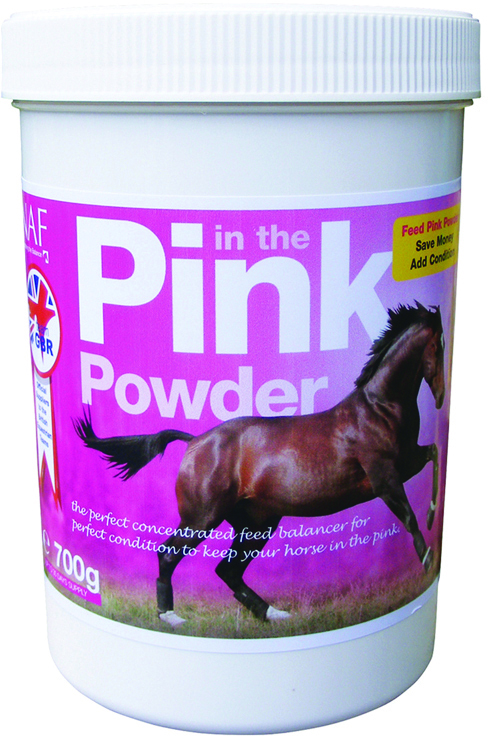 NAF in the Pink Powder is a feed supplement formulated to have your horse in the best condition possible. It contains vital vitamins; minerals & micronutrients, as well as probiotics & live yeasts which optimise gut function. NAF in the Pink Powder supports the natural digestive process, which means that your horse can get the most out of their diet & fully absorb all of the necessary nutrients. NAF in the Pink Powder encourages optimum performance, health & vitality in all horses whether they be elite sport horses, or the family pet. Feeding Instructions: Feed maintenance rates for everyday life & feed concentrated rates for times of peak requirement, eg horses that are in poor condition, or travelling. Horses- For Concentrated use feed 32g daily For Maintenance use feed 24g daily Ponies- For Concentrated use feed 24g daily For Maintenance use feed 16g daily 700g will last a horse upto 29 days (based on 24g daily) or a pony upto 43 days (based on 16g daily) 1.4kg will last a horse upto 58 days (based on 24g daily) or a pony upto 87 days (based on 16g daily) 2.8kg will last a horse upto 116 days (based on 24g daily) or a pony upto 175 days (based on 16g daily) 10kg will last a horse upto 416 days (based on 24g daily) or a pony upto 625 days (based on 16g daily) NAF is part of the BETA NOPS scheme.